In San Miguel, Globe, Smart & the 700 MHz Band for Dummies [Pt. 1 of 2], ThinkingPinoy explained what the 700 Megahertz (700 MHz) band is. Now that we got that out of the way, it’s time to talk about the story of the 700 MHz spectrum in relation to mobile internet and the Philippine Telecom industry at large. This post serves as the second part of that article. However, instead of using the title “San Miguel, Globe, Smart & the 700 MHz Band for Dummies [Pt. 2 of 2], I decided to use the title above as it provides is better describes this post’s content. Warning: This will be the longest article that I, ThinkingPinoy, has ever written, so I would like to apologize in advance if reading this will take a lot of time. I felt that it’s high time for the public to have a deeper working understanding of how messed up the PH telco industry is, so that each of us can provide more meaningful contributions to the PH Telco debate. Let’s be clear about what is what, which is which, and who is who. The 700 MHz band refers to the range of frequencies from 698 MHz to 806 MHz, which correspond to UHF TV channels 62 to 69. That is, the 700 MHz band is 108 MHz “wide”. Of the 108 MHz in this band, 90 MHz, or a vast majority of the available frequencies, is effectively owned by San Miguel Corporation (SMC). But technically, SMC doesn’t own the 700 MHz band. 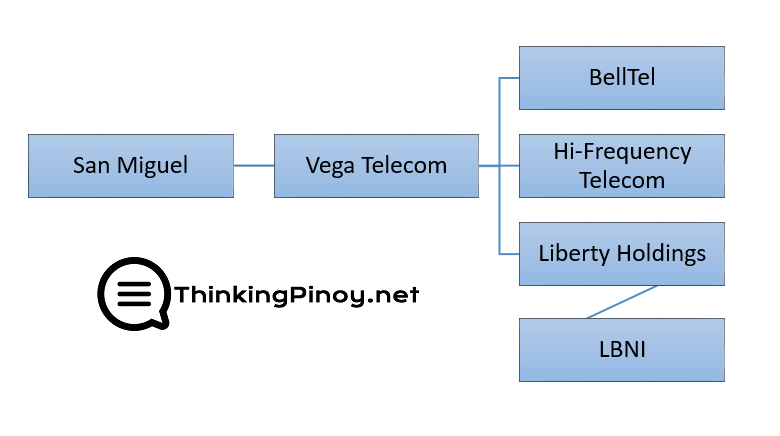 Instead, SMC owns Vega Telecom which, in turn, owns BellTel, Liberty Telecommunications Holdings (Liberty) and Hi-Frequency Telecom (HFT), among others. Lastly, Liberty Holdings owns Liberty Broadcasting Network Inc. (LBNI). Now, LBNI and HFT own 80 MHz and 10 MHz, respectively. Hence, SMC doesn’t technically own 90 MHz of the 700 MHz spectrum, but it practically does. From this point forward and to facilitate discussion, we refer to LBNI’s 80 MHz when we say “700 MHz”, unless otherwise specified. Liberty belonged to someone else in the early 2000’s, and it was under the previous management that LBNI’s 700 MHz spectrum assets were acquired. Mobile internet has yet to go mainstream during those times, so NTC designated the MHz band for UHF TV broadcasting. As LBNI’s name suggests, the 700 MHz assets were indeed intended for UHF TV broadcasts. However, these 700 MHz assets were never utilized and was just “left in the parking lot”. Why? If subsequent events were an indication, then 700 MHz remained idle because Liberty, as a business, was a failure. Management suspended operations in 2005 citing “lack of capital”. In Liberty’s case, “lack of capital” served as a fancier term for a staggering P1.7 billion worth of debt from various banks [ABS]. To avoid total bankruptcy, Liberty asked the courts in 2005 if it can undergo corporate rehabilitation and debt structuring [Inq]. The courts granted Liberty’s petition, allowing the latter to commence with a 10-year rehab plan commencing in 2006 and scheduled to end in 2016 [Inq]. The core of the 10-year rehab plan is the addition of WiMAX internet products, which would make up 90% of its projected revenues [ABS]. According to Liberty, the 700 MHz band is integral to its WiMAX offerings, and this allowed Liberty to hold on to its 700 MHz assets at least until 2016, despite Globe and Smart repeated requests for the NTC to redistribute the 700 MHz spectrum. By 2008, Liberty has yet to offer any WiMAX products. Instead, it was allegedly leasing part of its 700 MHz assets to Smart. 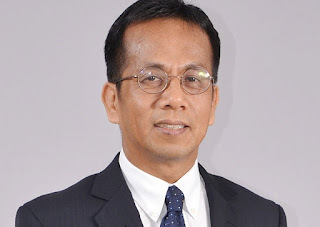 RCBC raised this issue when it sued debtor Liberty, alleging that the lease of assets effectively makes it impossible for Liberty to offer WiMAX, as it wouldn’t have the bandwidth to broadcast WiMAX signals to begin with [Star]. If granted, RCBC would have forced Liberty to auction its 700 MHz assets to the highest bidder. In fact, the NTC was actually planning to revoke Liberty’s 700 MHz assets pending a court decision [TV5]. Regardless of who’s lying, the fact remains Liberty never offered WiMAX up to this point. By 2009, Liberty’s losses ballooned to a whopping P212 million [ABS]. Yes, that’s how bad the situation was. 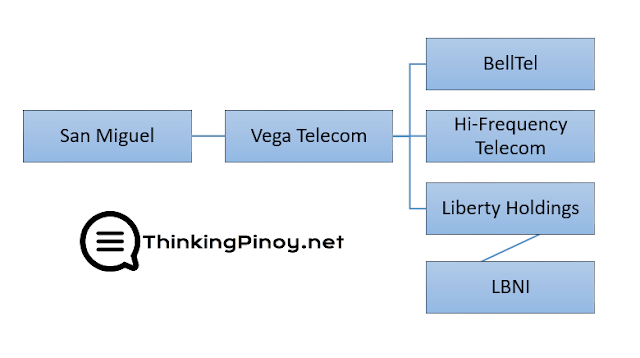 Through its subsidiary Vega Telecom, SMC acquired a controlling stake in Liberty in 2009. A year later and with SMC’s guidance, Liberty partnered with the Qatar Telecom to launch Wi-Tribe Philippines in 2010 [Star]. Initially available in Metro Manila, Wi-Tribe PH had 11,000 subscribers by the end of 2010[GT], a promising start for a telecom startup. SMC had high aspirations for Wi-Tribe. In 2011, Wi-Tribe announced plans to expand in Subic by offering 4G WiMAX and LTE services using the 2.5 GHz and 700 MHz frequencies [ABS]. Initially, Wi-Tribe planned to deploy 75 sites using the 2.5 GHz frequency [Amojelar 2012], suggesting that Wi-Tribe still hasn’t used it 700 MHz assets. PLDT seems to have gotten NTC’s nod, as a google search on “Wi-Tribe Subic” entries after 11 December 2013 yields no relevant results.But Wi-Tribe’s main problem is not just about finding new business. Instead, its largest dilemma is how to keep existing ones. Wi-Tribe was looking so far into the future, it forgot to take care of the present. In the early 2010s, most network providers charge around P800 for unmetered 1 to 3 Mbps connections. These connections, however, rarely reach anywhere near 1 Mbps Moreover, Globe’s P800-a-month 512 kbps WiMAX [YugaTech], back then, was so bad you’d think it’s dial-up. Wi-Tribe’s entry appeared to be a breath of fresh air for frustrated consumers who have run out of options. The new company offered P1000-a-month 1 Mbps WiMAX connections that actually register 1 Mbps. 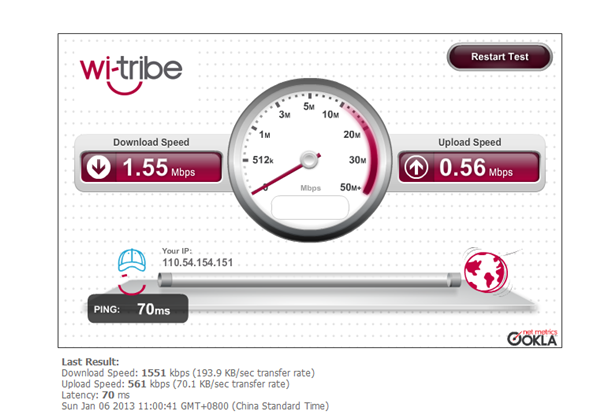 But there’s a catch: Wi-Tribe clocks 1 Mbps when it’s online, which isn’t all the time. It also has a data cap of 3 GB per month, over which the speed is throttled to a PhilPost-fast 256 kbps [YugaTech]. Subscriber losses overwhelmed Wi-Tribe’s revenue from its remaining customers. SMC tried to resuscitate the ailing company several times, but to no avail. In utter defiance of common sense, Liberty said it completed its corporate rehab program in May 2015. This is 20 months ahead of December 2016 deadline set in its court-approved plan in 2006 [Star]. The court effectively agreed “that the objectives of the rehabilitation have been successfully met [ABS], whatever that means. Everyone was confused as to why an ailing company that hemorrhaged billions in the last decade prematurely declared a successful rehab program. But the enigma doesn’t end there. 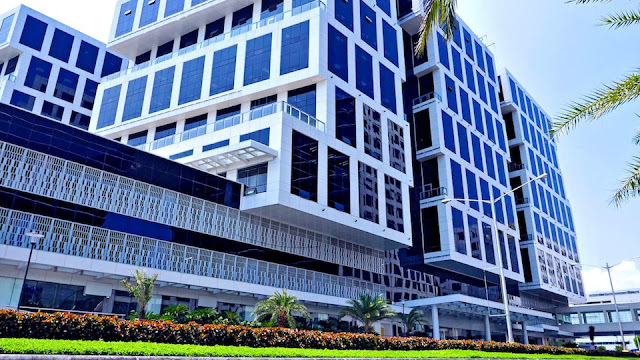 What puzzled everyone even more is SMC’s announcement that it will buy out Qatar Telecom’s share [MS], which will give SMC 100% ownership of Wi-Tribe Philippines. The deal was consummated in August 2015 [TG]. All of these made no sense. It appeared to be the epitome of financial idiocy. That is, until Telstra entered the limelight. In September 2015, or two months after the SMC buyout of Wi-Tribe PH, Australian telco giant Telstra confirmed that it has held negotiations with SMC regarding a prospective wireless joint venture[TG]. Up to this point, Liberty was able to utilize its 2500 MHz assets, but it had no technology to fully take advantage of the 700 MHz spectrum. In this regard, Telstra was keen to use the 700MHz spectrum to deploy 4G LTE technology in the country, as Telstra switched on its Australian ‘4GX’-branded 700MHz 4G network in November 2014[TG]. The Philippines has the 7th slowest LTE speed on earth [CNN], so you can just imagine the public’s excitement over this development. With Telstra’s possible entry into the PH telco market, some sites even call the Aussie firm “the savior of Philippine Internet”. 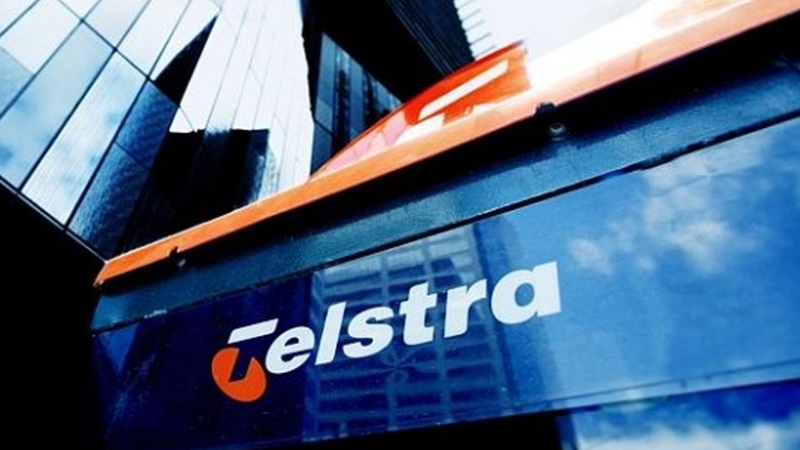 Telstra announced October that it will be funneling US$ 1 billion into the PH telco industry to rival Globe and Smart [SMH]. However, while the deal was still being finalized, Globe and Smart were quick to take action. In November 2015, or two months after the official Telstra-SMC announcement, Globe and Smart called upon the NTC to auction off the “highly unutilized but very powerful” 700 MHz spectrum currently owned by SMC via its subsidiary Vega Telecom (Remember that Vega, in turn, owns Liberty and HT, which collectively own much of the 700 MHz spectrum). Aside from non-utilization, Globe and Smart argued that the 700 MHz spectrum was initially intended for UHF TV broadcasts when it was awarded to Liberty more than a decade ago. Globe and Smart argues that this non-utilization and obsolete allocation should prompt the NTC to revoke Vega’s 700 MHz license and redistribute the spectrum to telco players who can actually use it (i.e., Globe and Smart) [Globe]. PLDT-Smart regulatory and policies head Ray Espinosa said, “100 MHz assigned and held by three companies is just too much. There is a lot of subscribers out there already pining for faster mobile Internet service and we can solve that well if we are also given some access to that [Star]”. In response to this brouhaha, NTC Director Edgardo Cabarios said the conditions to recall the allocation do not apply to SMC as it has obtained permit to purchase equipment for building its network and it continues to pay the fees [Star]. “How can you reassign when it has presently been assigned? [Inq]” Cabarios said. “They want what we have, so that we could not operate [MS],” Ang said, referencing to Telstra’s potential PH entry. 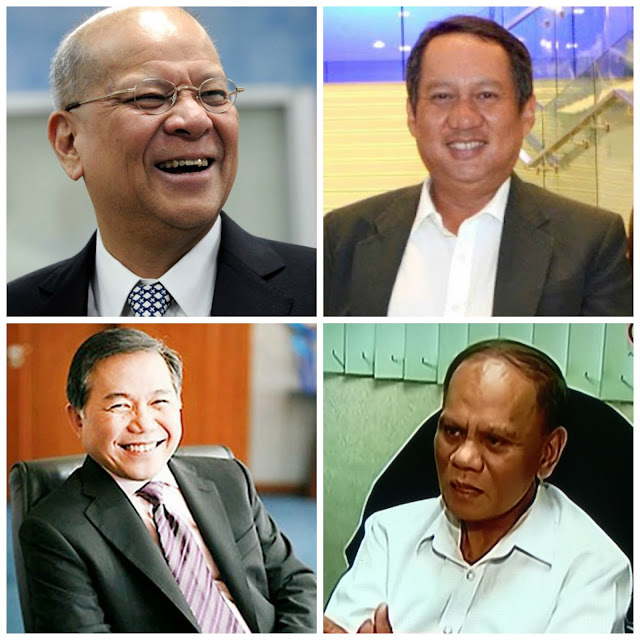 The Philippine Telco Cartel’s intergalactic profit margins is an open secret. DEFINITION: A cartel is an association of manufacturers or suppliers with the purpose of maintaining prices at a high level and restricting competition. In the Philippines, the Telco Cartel consists of PLDT-Smart and Globe Telecom. Creator Tech co-founder Steve Mackay said this reality is the key reason why the Telstra expressed interest in the Philippines. "The business case for 4G in the Philippines, where both of the incumbents (Globe and Smart) are making profit margins that nobody else (in the world) is making, is a no-brainer and I can absolutely see why [Telstra would] they'd do it,” MacKay said [SMH]. Creator Tech is a boutique analyst company that has written reports for large global companies and organizations like the Communications Alliance. However, MacKay added, "But what are the costs, what are the risks to the costs and why doesn't Telstra seem to be disclosing any of those?" The legal roadblocks started in November 2015 will most likely last for years, or even decades, given the Philippines’ snail-paced justice system. Smart and Globe, however, did not stop at that. They want blood. 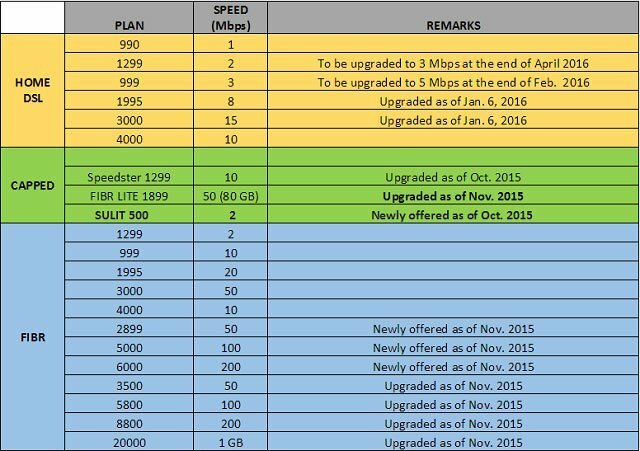 The Smart-Globe telco cartel upped the ante by giving out free upgrades and other service improvements in as early as late October 2015 [BM]. On 20 October 2015, PLDT launched the fastest advertised fixed broadband service in the country with its 1 Gbps (1000 Mbps) plan [Rap]. Globe also announced a similar 1 Gbps service two days later [Rap]. Globe also upgraded its mainstream internet services during the same period [Rap]. In the blink of an eye, it appears that Philippine internet service options have suddenly become at par with those in developed countries. For example, PLDT’s P2899 50 mbps plan [Fibr] translates to US$62.40 (US$ 1: Php 46.435). A 25 mbps connection in New York City costs $55 [PBS], so PLDT actually offers 100% faster internet at almost the same price! Apparently, the rationale behind all these is to kill Telstra. "Although risks are higher … we see potential long-term opportunity for Telstra and San Miguel. Our analysis indicates that the Philippines market is the most concentrated market in Asia,” Tong added [SMH]. Globe and Smart has effectively sued SMC via NTC, and has virtually undercut Telstra’s potential service offerings by offering prices lower than in most developed countries. But the telco cartel still isn’t satisfied. It attacked, and attacked, and attacked. Aside from repeatedly reiterating earlier calls for 700 MHz reallocation [GMA, TV5], Smart and Globe continuously ramped up their services to make it Telstra’s potential entry even more difficult [BM]. While speed upgrades and additional digital content are welcome additions, ThinkinPinoy fears that this newfound zeal among the telco incumbents may fizzle depending on the outcome of the SMC-Telstra deal. The dagger to heart – the final straw – was finally planted when Globe and Smart, through the NTC, urged the newly-formed Philippine Competition Commission [PCC] to probe SMC’s control over the 700 MHz spectrum, citing this practice as “anti-competitive” [MS]. In response, PCC founding chairman Arsenio Balisacan said one of the sectors the PCC would focus on is the telecommunications industry, which includes a study of the 700 MHz issue and how San Miguel was able to obtain and maintain control of the scarce frequency in spite of calls for a public bidding [MS]. The PCC derives its mandate from Philippine Competition Act, penned by Senator Bam Aquino and signed on 21 July 2015 by his uncle, President Noynoy Aquino [RA 10667].